The Smeg ECF01 is a retro coffee machine designed to look like an appliance from a 1950s kitchen. It comes in four different colours: cream, pastel blue, red and black – and is available to buy on Amazon for £279. Technically, the Smeg ecF01 is a manual espresso machine, which means you have to measure pre-ground coffee to make your espresso. 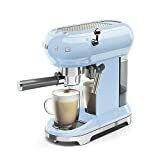 Manual espresso machines aren’t usually the most convenient appliances, as working with the ground coffee can be messy as well as time-consuming. The benefit, however, is that you can grind up literally any coffee bean and use it in a manual espresso machine. It comes in the form of a specially-designed basket that lets you use ESE pods (easy serving espresso aka disposable coffee pods). You can buy these from multiple places online, including Amazon, and make quality coffee in seconds. The machine also has a dual-nozzle attachment that lets you make two espressos simultaneously. Operating the coffee side of things is just as simple. Fill the 1.5L reservoir and press the power button that’s neatly hidden at the back right of the machine. From here the machine has just three buttons. One to make a single espresso, another to make a double espresso and a third to engage the steam wand (…and you toggle the flow of steam using the chrome handle). See also Nespresso Krups Prodigio review. Like all good coffee machines, there is a removable cup tray so you can use bigger mugs as well as espresso cups. There’s even a cup warmer located on the roof of the machine. There isn’t a better-looking coffee machine than the Smeg ecF01. 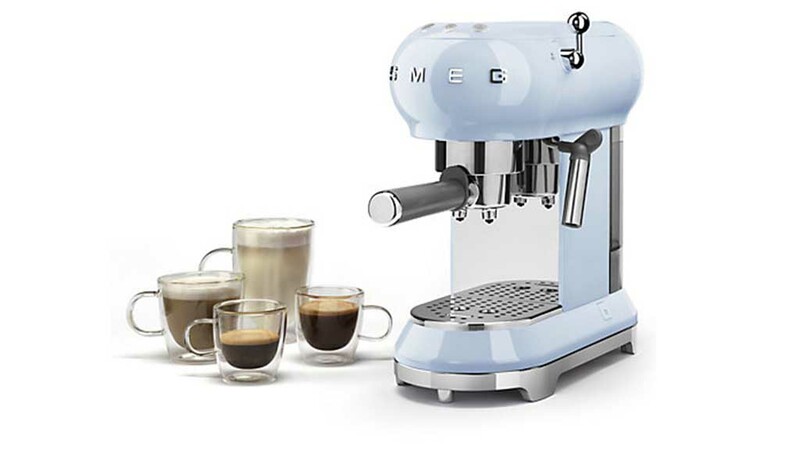 £289 is a little more expensive than a lot of other manual espresso machines, but what you’re getting with the Smeg is style (primarily) and the knowledge that you’re buying quality. Buy this and the only worry you’re going to have the quality of coffee beans or pods. See also: The BEST capsule coffee machines of 2017.